These brief remarks focus on three issues: 1) economic policy developments during the last year or so; 2) macroeconomic performance; and 3) performance of certain critical sectors of the economy. Policy developments since August 1996 include passage of the long-expected legislation reforming the banking system and regulations limiting internal migration and further tightening activities of the self-employed. The government has continued to hinder activities of the self-employed. Both Fidel Castro and Carlos Lage lashed at “irregularities” of self-employed workers and vowed to use the full force of the law to ensure that they paid all fees and taxes and did not engage in illegal activities. Regulations passed in May 1997 set limitations on the rental of rooms to citizens or foreigners, requiring a permit for such rental activities and payment of a tax.12 While the government justified the regulations on the grounds that it was intended to keep a better control of internal migrants and foreign citizens, it appears that the objective was also to discourage the rental of space in private homes to foreign visitors and businessmen, forcing them to live in state-operated tourism hotels or rent more expensive space from state authorities. 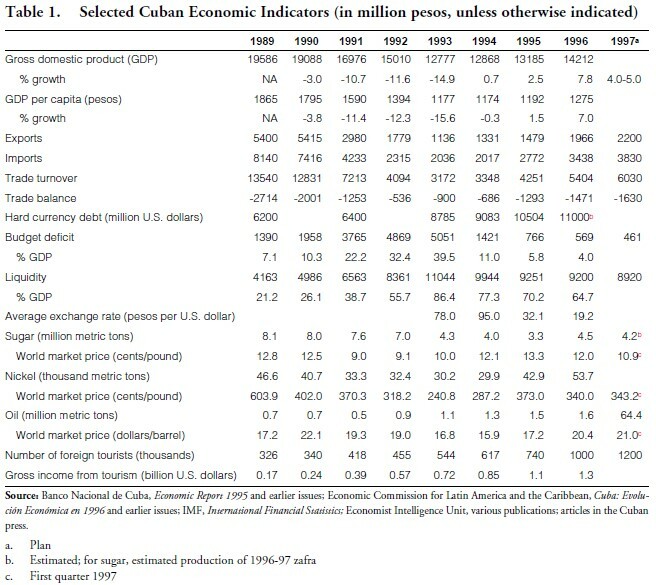 Table 1 brings together available statistics on Cuban economic performance during 1989-96 and projections for 1997 from various sources. Most of the data are official Cuban government statistics; because their reliability is questionable, care should be exercised in using them. According to Cuban official statistics, the gross domestic product (GDP) at constant prices grew from about 13.2 billion pesos in 1995 to 14.2 billion pesos in 1996, or by 7.8 percent, 56 percent higher than the 5 percent growth rate that had been anticipated. The corresponding growth rate in GDP per capita was 7.0 percent. Thus, 1996 was the third consecutive year of positive economic growth (Cuban official statistics reported growth rates of 0.7 percent for 1994 and 2.5 percent for 1995). Cumulative GDP growth during 1994-96 was 11.2 percent and 5.3 percent in per capita terms, compared to declines during 1990-93 of 34.8 percent and 36.9 percent, respectively. That is, the 1994-96 “recovery” has regained only about one third of the ground that was lost in national production during 1990-93. GDP per capita in 1996 has been estimated at 1275 pesos, 31.6 percent lower than the 1865 pesos recorded in 1989. Cuba’s 1996 merchandise trade deficit amounted to nearly 1.5 billion pesos, 13.7 percent higher than a year earlier. The value of merchandise imports grew by 24 percent, in part because of higher world market prices for imports of foodstuffs and of oil; according to Minister Rodríguez, foodstuffs imports were $118 million higher and oil imports $108 million higher than in 1995 because of higher world market prices. Meanwhile, the value of merchandise exports grew by nearly 33 percent, despite the fact that world market prices for Cuba’s two main exports—sugar and nickel—were lower in 1996 than in 1995. According to Minister Rodríguez, external financing remains the main limitation on sustained recovery; in 1996, Cuba was forced to rely on short-term financing at very high interest rates. The hard currency debt at the end of 1996 has been estimated at about $11 billion, 4.7 percent higher than at year-end 1995. One of the bright spots seems to be the domestic stabilization program. The budget deficit, which had ballooned to over 5 billion pesos in 1993 (nearly 40 percent of GDP15), has been reduced sharply since then, to 570 million pesos in 1996 (4 percent of GDP). Similarly, liquidity (currency in circulation) has also fallen steadily since 1993, to 9.2 billion pesos in 1996 (about 65 percent of GDP). The annual average unofficial exchange rate (recall that, officially, the Cuban peso is still valued at par with the U.S. dollar) fell in 1996 to 19.2 pesos/U.S. dollar from 32.1 pesos/U.S. dollar a year earlier. While the strengthening of the Cuban peso vis-a-vis the U.S. dollar may be interpreted as an increase in the confidence of the population regarding the buying power of the peso, further research is needed to determine whether the strengthening of the peso reflects manipulation by the Cuban government through its network of Currency Exchange Houses. • growth in agriculture of 4.6-5.6 percent, manufacturing of 6-7 percent, and construction of 4.1-5.1 percent. In June , well ahead of time, the government drew up a set of directives for drawing the plan. At that time, based on the framework contained in those directives, discussion meetings were held in each enterprise, to evaluate the plan’s potential from the grass roots upwards. On the basis of those meetings, the agencies and administrative councils in each province presented their planning proposals in September. These proposals were evaluated by the Ministry of the Economy and Planning and were submitted to the Executive Committee of the Council of Ministers, which defined the necessary priorities and adjustments that were subsequently worked out in detail with every entity and administrative council in a discussion process that, for the first time this year, permitted the plan to be structured in sectoral and territorial terms. The attitude of the population toward the current economic situation is best described by a Cuban engineer who makes clay ashtrays and sells them to foreign tourists: “We are depressed and repressed.”29 The economy is operating at a very low level of capacity; government intervention in the economy has intensified; and, more importantly, there is nothing in sight that suggests a willingness on the part of the leadership to consider meaningful economic and political reforms that would lead the island out of the low growth trap in which it now lingers. 1. These remarks present strictly the opinions of the author. 2. “Estamos aún en ‘período especial,’ dice ministro,” El Nuevo Herald (25 abril 1997), p. 6A. 3. “The Forum serves to demonstrate the level of awareness, unity and integration in Cuba,” Granma International Electronic Edition, no. 2 (1997). 4. Susana Lee, “We have initiated economic reforms within socialism,” interview with Carlos Lage, Granma International Electronic Edition, no. 10 (1997). 5. “No habrá participación privada en la mediana empresea de Cuba a corto plazo, dice el gobierno,” Notimex (1 abril 1997), Wold Wide Web. 6. “Socialism is here to stay,” speech by Raúl Castro at the event marking the 36th Anniversary of the Proclamation of the Socialist Nature of the Cuban Revolution,” Granma International Electronic Edition, no. 16 (1997). 7. “The Party of Unity, democracy and the human rights we defend,” Granma International Electronic Edition, no. 21 (1997). See also Juan O. Tamayo, “Cuba chills talk of change,” The Miami Herald (May 26, 1997), p. 20A and “Call to the 5th Congress of the Communist Party of Cuba,” Granma International Electronic Edition, no. 16 (1997). 8. “Central Bank of Cuba established,” Granma International Electronic Edition, no. 25 (1977). 9. “The consequences of neoliberalism affect Europe itself, not only the Third World,” speech by Fidel Castro at the ceremony for the 35th Anniversary of the Young Communist League, Granma International Electronic Edition, no. 14 (1997). 10. “Entra en vigor decreto de migración en Cuba,” El Nuevo Herald (12 mayo 1997), p 2B; “Capital en ruinas es meca que atrae a miles,” El Nuevo Herald (14 mayo 1997), p. 6A. 11. “Desalojan 1600 de La Habana,” El Nuevo Herald (28 abril 1997), p. 2B. 12. “Cortan alas al negocio de alquilar viviendas,” El Nuevo Herald (17 mayo 1997), p. 6A. 13. “Economy grows by 7.8 percent,” report on 1996 economic results and 1997 economic and social plan, presented to the National Assembly by Minister of the Economy and Planning José Luis Rodríguez, Granma International Electronic Edition, no. 2 (1997). The most detailed passage of the report dealing with sectoral output growth reads: “there was a 17.3 percent rise in agricultural production, including hunting, forestry and fishing, comparing well with the planned increase of eight percent; manufacturing grew by 7.8 percent, less than the 9.7 percent increase expected, basically due to financial difficulties. Construction, for its part, saw growth of 30.8 percent, compared to the planned increase of 21.6 percent.” Not only are some critical sectors (e.g., services) missing altogether, but the relative weights of the sectors are not known. Along the same line, there is no information on how the sectoral growth indices mentioned by Rodríguez were produced and how output of joint ventures, of the self- employed and of agricultural cooperatives were recorded. The same is true for sales in agricultural markets outside of government control. 14. E.g., Marta Beatriz Roque Cabello and Arnaldo Ramos Lauzurique, “PIB: (Producto Interno Bruto),” in Documentos del Instituto Cubano de Economistas Independientes, pp. 1-5. Miami: Cuban Studies Association, 1997; and Carmelo Mesa-Lago, “¿Recuperación económica en Cuba?,” Encuentro de la Cultura Cubana, no. 3 (Winter 1996/1997), pp. 54-61. See also Mesa-Lago, “The State of the Cuban Economy: 1995-96,” in Cuba in Transition– Volume 6, pp. 4-7. Washington: Association for the Study of the Cuban Economy, 1996. 15. The GDP series in Table 1 is reportedly at constant prices of 1981, while the budget deficit and liquidity figures are reportedly at current prices. Since time series of GDP at current prices are not available, the budget deficit/GDP and liquidity/GDP ratios in Table 1 combine current and constant price data. They should therefore be used only as measures of general trends rather than point estimates. 16. “Successful” in the sense that it reversed the downward trend in production that began in 1992. Production in 1995-96 was still substantially lower than the 7-8 million tons per annum produced in the second half of the 1980s. 17. Carlos Batista, “Zafra azucarera no superará la del 96,” El Nuevo Herald (3 mayo 1997). See also “Pablo Alfonso, “Zafra parece encaminada al fracaso, dicen especialistas,” El Nuevo Herald (24 abril 1997), p. 8A, and “Régimen cubano podría cerrar centrales ineficientes,” El Nuevo Herald (13 mayo 1977), p. 1B. 18. Marc Frank, “Cuban sugar harvest is poor,” The Journal of Commerce (June 9, 1997), p. 5B; and “Zafra termina con cifras en rojo,” El Nuevo Herald (June 10, 1997), p. 6A. 20. Larry Rohter, “Cuba Sees New Threat to Recovery: A Weak Sugar Harvest,” The New York Times (May 18, 1977), p. 11. 21. “Tourism Convention and annual COTAL Congress to be held in May,” Granma International Electronic Edition, no. 13 (1997). 22. Rodolfo Casals, “Number of tourists to increase by 20 percent,” Granma International Electronic Edition, no. 9 (1997). 23. Kevin G. Hall, “Cuban blasts leave investors wary, tourist industry jittery,” The Journal of Commerce (July 15, 1997), p. 5A. 25. Rodolfo Casals, “Helms-Burton: In effect for one year,” Granma International Electronic Edition, no. 10 (1997). For the text of Law No. 80 see “Reaffirmation of Cuban Dignity and Sovereignty Act,” Granma International Electronic Edition, no. 4 (1997). 26. “Anuncian acciones contra enmiendas a la Helms,” El Nuevo Herald (6 junio 1997), p. 6A. 27. Andrés Oppenheimer, “Firm hangs up on Cuba deal,” The Miami Herald (June 27, 1997), pp. 1C, 3C and Larry Rohter, “Mexican Conglomerate Abandons Cuban Phone Venture,” The New York Times (June 30, 1997), p. D2. 28. Christopher Marquis, “ITT paid for confiscated Cuban properties,” The Miami Herald (July 24, 1997), pp. 1C, 3C. 29. Juan O. Tamayo, “Sense of despair pervades Cuba as economy falters,” The Miami Herald (August 2, 1997), p. 1A.